Splendid views and regular reminders of the terrible hardships endured by the neighbouring village of Eyam, make this a very special walk. The first part of the walk leads you down to the River Derwent for a short stroll along the riverbank, before turning west at Froggatt Bridge and climbing steadily up towards Eyam. Walk produced by Discover Derbyshire and the Peak District who have many more interesting walks on their website. After walking through an area of woodland the path begins to descend, and the Riley Graves are passed. Enclosed by a protective stone wall in the middle of a field, seven members of the Hancock family are buried. All of them died from the plague within a week of one another and were buried by the mother, the sole survivor. On reaching Eyam, the Lydgate Graves provide another reminder of the horrific death toll inflicted by the plague. 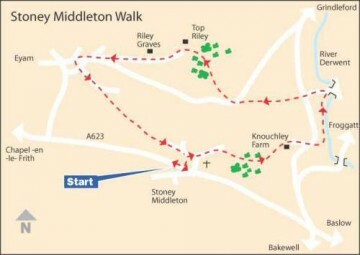 Soon after leaving Eyam, the walk crosses an area of moorland with excellent views of Stoney Middleton lying in the valley below. At this point, look out for the Boundary Stone, where during the plague the people of Eyam collected food left by the villagers from Stoney Middleton. Coins soaked in vinegar were placed in the holes in the stone, in payment. Walk back into the village from the car park passing behind the former Toll House, now a fish and chip shop, along The Nook turning to the left in front of the church and then within a few yards right. Soon after passing the Roman Baths, where the road bends to the left, go through a gate stile and continue straight ahead. After a short distance angle towards a gap on the left, to reach a track that climbs up between thorn bushes. On emerging in an open field, keep close to the hedge on the left and after going over a wall stile, cross the next diagonally, to the left hand side of Knouchley Farm. Walk round the farm buildings and follow the drive down to the main road. Cross the road to the stile opposite and walk down the field, keeping close to the wall on your left, to a stile close to the bottom corner. Angle to the left across the next field as it descends gently to the River Derwent. Continue along the riverbank to Froggatt Bridge, where you turn left and follow the road up to the ‘T’ junction at the top. Go over the stile opposite and walk straight up a long field. In the next field, keep close to the wall on the right to reach a road. 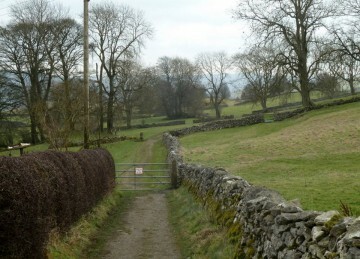 Cross the road to the left and go through the stile opposite, and walk straight up the field keeping close to the wall. After going over a stile in the top corner of the field the walk continues up a rough track through woodland before turning left at a ‘T’ junction of tracks. The track soon joins a lane leading from Top Riley Farm, passing the ‘Riley Graves’ on the way down to the outskirts of Eyam. Turn right at the bottom of the lane into the village, and just after passing Eyam Tearooms, turn sharp left up Lydgate. Where the road forks left to Stoney Middleton, your route is straight on to the right of a cottage and along a field track. 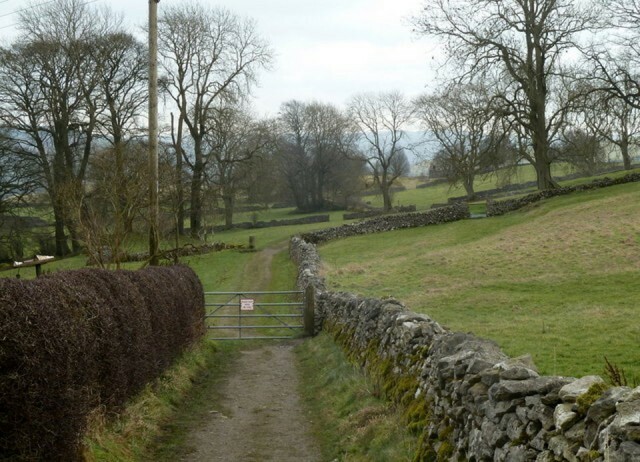 The track soon gives way to a narrow walled path leading to a large moorland field. Keep to the right of a group of trees as the path descends quite steeply to a lane back into Stoney Middleton. Turn right along the lane and then right again to reach the A623 through Stoney Middleton, from where you can retrace your steps back to the start of the walk.